When you smile, people instantly take note of your teeth. Dental imperfections, no matter how minor, can cause self-consciousness, making you make every attempt to hide your mouth. And a refusal to smile can negatively impact a person’s initial impression. Gaps between your teeth, while viewed by some as cute and endearing, are one of these imperfections, and one that can harm your oral health. Not only does gum disease cause diastemas, diastemas can cause gum disease. 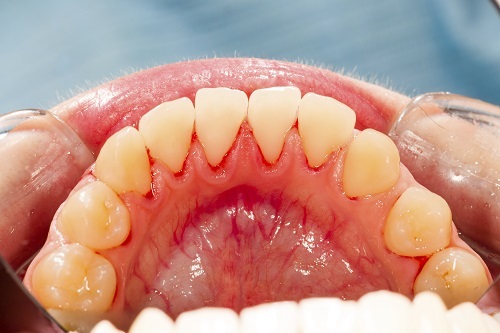 This is because if you have gaps between your teeth, food is more likely to become lodged there. Plaque can build up and bacteria can collect. If the spaces aren’t properly cared for (flossed), bacteria can continue to grow, causing cavities and leaving you more susceptible to gum disease. Gaps can also lead to poor alignment. This is because when there is extra space between your teeth, your teeth may shift. If the teeth shift, they no longer line up properly, which throws off your bite. An off bite can cause uneven tooth wear, problems with your TMJ and pain. • Oral surgery (such as a frenectomy). • Cosmetic procedures (porcelain veneers or dental bonding). • Replacing missing teeth (bridges, partial dentures, dental implants). If the gaps between your teeth are affecting your confidence, or your oral health, be sure to contact our office about the best options for you. The right fix can give you a beautiful, and healthy, smile that everyone will notice.